The Tableau Foundation has teamed up with PATH to eliminate malaria in Zambia and create a replicable model that can be deployed across the globe. The five-year “Visualize No Malaria” campaign empowers responders with real-time analytics to help save lives. Every year, malaria claims nearly 600,000 lives, most of them children under 5. Nearly every minute, someone dies from the treatable disease. Community health workers in Zambia currently catch only half of the cases of malaria. To make malaria history, they need to deploy resources faster than the disease can spread—and that’s where Tableau comes in. Through this initiative, we’re providing software, training, and funding to PATH’s teams on the ground so they can make data-informed decisions when it matters most. Health workers will report new cases of malaria in real-time. 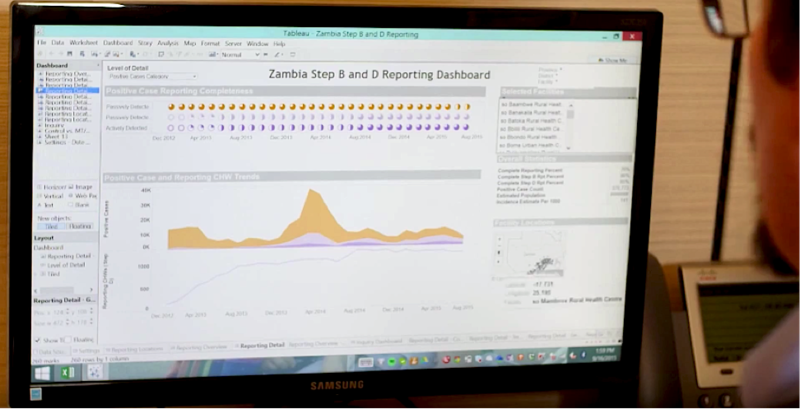 Then Zambia’s Ministry of Health will use Tableau to see and understand that data, and deploy the appropriate resources to contain the outbreak. “Where to deploy your diagnostics, where to put bed nets, where you are lacking in bed nets—all those things are driven by information that is helped hugely by the ability to visualize that information,” says Duncan Earle, PATH’s director of Malaria Control and Elimination Partnership in Africa. Interactive dashboards can also help better manage community health workers across large regions. Managers can easily see which teams are moving efficiently, and which teams may need more resources. The campaign will launch in areas where the disease is already under control, and work to eliminate it entirely. It will then scale outwards to expand these safe zones across the entire country. We’re committed to making malaria history, and we welcome your support. To learn more about the campaign, visit VisualizeNoMalaria.org.